Our everyday arrangements can be made in a basket, vase, or wrapping.Prices vary depending type of flower chosen. In a hurry? Stop by the shop and take a look at our pre-made arrangements in our coolers. Vase arrangements begin at $17 and increase depending on size and flower wanted. We recommend a budget of $35 for a regular sized arrangement. Basket arrangements start at $35 and increase depending on size and flower wanted. We recommend a budget of $50 for a regular sized basket. Birthday and get well arrangements vary on price depending on size, flower, and if you wish to add any additional items such as balloons and chocolates. 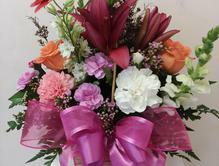 Baby arrangement prices vary depending on size, type of flower, and type of vase. We have a variety of baby keepsake vases and balloons to make the arrangements extra special.